The Clockapult of Winter Past is a Clockapult of Time with a blueprint skin applied. This more festive version of the Clockapult of Time sends caught mice into the not-so-distant past where they learn a valuable lesson that gives mice a change of heart. The Clockapult of Winter Past is not sold by any Trapsmith. It can only be crafted given the proper ingredients. 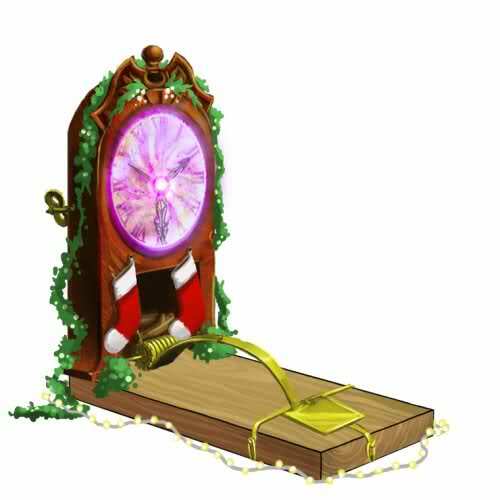 Clockapult of Time – Source of Clock Parts for crafting the Clockapult of Winter Past. 24 November 2010: The Clockapult of Winter Past was introduced with the Great Winter Hunt 2010 and the skin was made available via Donations. 23 September 2011: The trap skin system was overhauled and the Clockapult of Winter Past Skin was changed to the Clockapult of Winter Past Blueprint. 29 July, 2015: The point requirement for the Clockapult of Winter Past was lowered from 20,000,000 to 12,500,000.